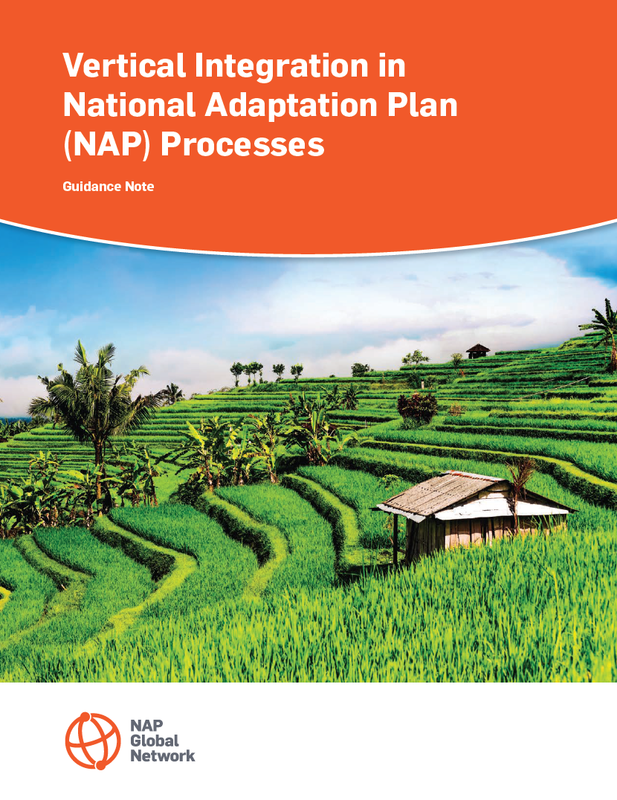 This guidance note is designed for country teams and other stakeholders interested in strengthening vertical integration in National Adaptation Plan (NAP) processes. In the context of the NAP process, vertical integration is the process of creating intentional and strategic linkages between national and sub-national adaptation planning, implementation and monitoring & evaluation (M&E). Recognizing the key role played by sub-national authorities and local organizations in advancing adaptation to climate change, the document outlines the key issues and questions to consider to facilitate vertical integration throughout the NAP process. Practical case examples are provided to illustrate the issues. The guidance note presents a flexible approach that can be adapted to the country’s context, capacities and available resources. Download the full paper from the right-hand column of this page. The text provided below provides an overview of the contents and key sections of the paper. Please see the full text for much more detail. Why Vertical Integration in the NAP Process? Where they are already in place, existing decentralization processes can provide entry points that facilitate effective vertical integration in the NAP process. Establishing or building on mechanisms for dialogue, coordination and information sharing between actors at national and sub-national levels throughout the NAP process helps to ensure continuous and broad-based engagement in the NAP process. • Identifying which functions are best undertaken by actors at different levels, including non-governmental actors such as civil society organizations and the private sector, can help to delineate roles and responsibilities in adaptation planning, implementation and M&E. Ensuring flexibility of institutional arrangements for the NAP process may help to respond to changes in the policy and governance context. Consideration of the information needs of different actors throughout the process of planning, implementation and M&E helps facilitate informed decision making at all levels. Establishing mechanisms for ongoing information sharing between actors at national and sub-national levels can enable learning and coordination. Provision of climate information at the appropriate scale and timeframe and in accessible formats will facilitate its application by sub-national actors. Facilitating dialogue between actors at different levels can help to merge scientific and indigenous climate information, to share experiences with adaptation and to ensure that adaptation actions are mutually supportive. For an inclusive and participatory process, consider what capacities are needed in the NAP team to facilitate vertical integration, including skills related to stakeholder engagement and provision of technical assistance. To realize their roles and responsibilities in relation to adaptation, sub-national actors— including local organizations—may require capacity development, including technical knowledge on adaptation as well as process-oriented skills such as inclusive facilitation and M&E. 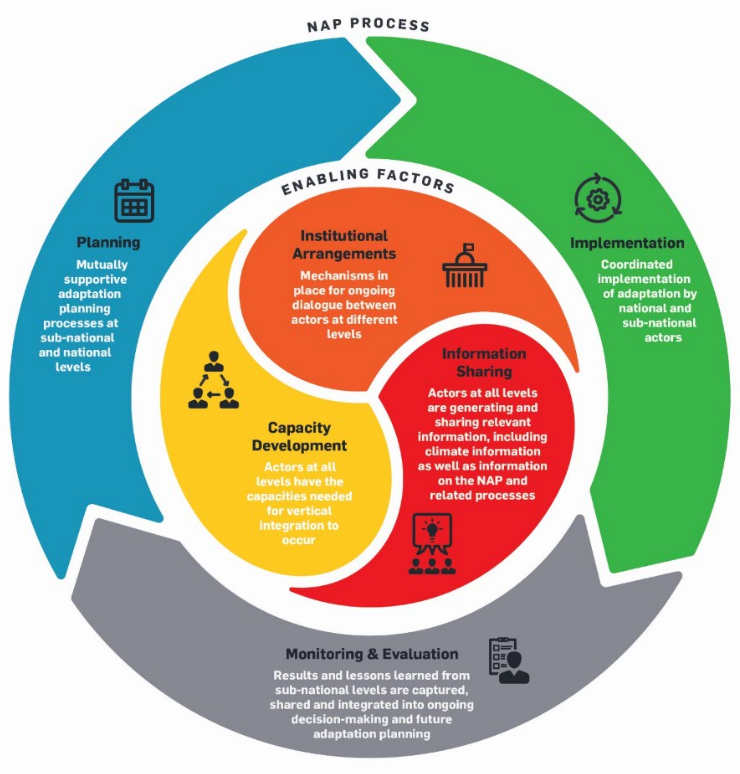 The integration of capacity development strategies for relevant actors within the NAP—including in implementation and resource mobilization strategies and M&E systems—can help to ensure that resources are allocated and progress is tracked. Consideration of how sub-national perspectives can best be integrated during the initiation of the NAP process enables appropriate design and sequencing of planning activities and outputs. A commitment to take sub-national diversity in development needs and climate vulnerabilities into account in the NAP process can facilitate adaptation planning processes that are participatory, gender-sensitive and inclusive of vulnerable groups. Where feasible and appropriate, integration of adaptation into sub-national development planning can increase sustainability and effectiveness of adaptation planning processes. Consideration of how adaptation options can best be prioritized for implementation at sub-national levels—in terms of the process, which stakeholders should be involved and how criteria for prioritization will be agreed—can help to ensure that the NAP process responds to needs. Sub-national actors may require support in costing of adaptation priorities and elaboration of resource mobilization approaches in order to develop implementation strategies. There may be opportunities to leverage existing mechanisms for local development funding to facilitate implementation of adaptation. Establishing transparent mechanisms can help to create an enabling environment for sub-national actors to access adaptation finance. A comprehensive national M&E system incorporates data and information from sub-national levels, with due consideration to how it will be collected, aggregated and synthesized. Linking M&E systems with updates to the NAP process helps to ensure that sub-national experiences and learning are captured. Sharing of synthesized results and strategic lessons from the M&E system with sub-national actors can support learning and integration in ongoing adaptation planning and implementation. To learn more, this webinar hosted by the NAP Global Network in April 2017 features presentations from two of the guidance note's authors—Angie Dazé and Hayley Price-Kelly—as well as a presentation by Aditya V. Bahadur (Action on Climate Today) that looks at country experiences with vertical integration in South Asia. The webinar aslo features an interview with Batu Krishna Uprety (Team Leader, NAP Formulation Process Nepal) about Nepal's experiences with vertical interation. You can download presentations from this webinar here. View this publication on NAP Global Network's website. Read a blog by the guidance note's author Angie Dazé on Vertical Integration: A Key Element of Inclusive, Effective NAP Processes. Read a recap of this guidance note's launch at COP 22 in Marrakech. Visit the NAP Global Network's website. Read the 'sNAPshot' on "Initiating sector integration of adaptation considerations"
Read "Targeted Topics: High-level political support & sectoral integration in NAP processes"
Ghana’s National Climate Change Policy (NCCP) put's into place robust measures needed to address most, if not all, of the challenges posed by climate change and climate vulnerability.